"I love this series of books and Planet of the Dogs sets the stage for those works that follow… This story borders between reality, a dream world, fantasy, fiction, reality and wonderful imagination… The author has done a wonderful job of weaving this tale, making it a first rate fantasy read, while at the same time addressing quite real problems and indeed, how to fix those problems." "…Planet of the Dogs shows how those of different backgrounds and cultures can work together in a peaceful manner to overcome massive obstacles if they choose to. Full of excitement and loving dogs, this first book in the series from Barking Dog Productions wants you coming back for more, making its readers wish such a world actually does exist! This is definitely a beautiful book… for children and adults alike who can close their eyes and wish for a better world ." Developer of the Pages for Preston therapy reading dog program. "I found myself smiling a lot while reading this book. The author does a wonderful job describing the actions of dogs in a way that you can see in your mind’s eye… The Planet of the Dogs series is geared towards children, but has a wonderful quality that allows parents and adults to enjoy the read as well." "Planet Of The Dogs has enough suspense to hold children’s interest without frightening them, and imparts an overall message about the power of unconditional love to change people’s hearts. And of course, this story will capture the heart of any child who loves dogs!" "Planet Of The Dogs is a full-fledged story... about dogs. Dogs who run the planet and are trying to bring good will peace to people of all ages. Think Wizard of Oz... where the good witch, cowardly lion, tin man, scarecrow, and even the wise old wizard are the dogs. And they're trying to instill good things upon all of the 2-legged humans who cross their path. " “I loved so many of the messages in the book -- messages that are important for children and adults to remember! It was nice to see all the different ways that dogs are beneficial in our every day lives as well as some of the less obvious ways that they bring happiness. I especially liked how the potential conflict was averted and how the book ended. It was nice to see a happy ending and have people realize what's important in life. " "This book will make kids want a dog for sure! The author does a great job of creating word pictures about the excitement of the dogs. It was fun reading about how a dog might think and act. 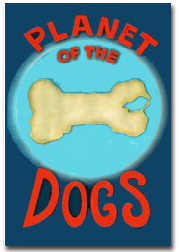 Planet Of The Dogs is a short, quick read and would be great to read to kids. " "It was great...I loved the story."